Coming to the end of my stash of candy hoarded from Halloween’s ‘Trick or Vote’ fun, I came across a packet of m&ms. 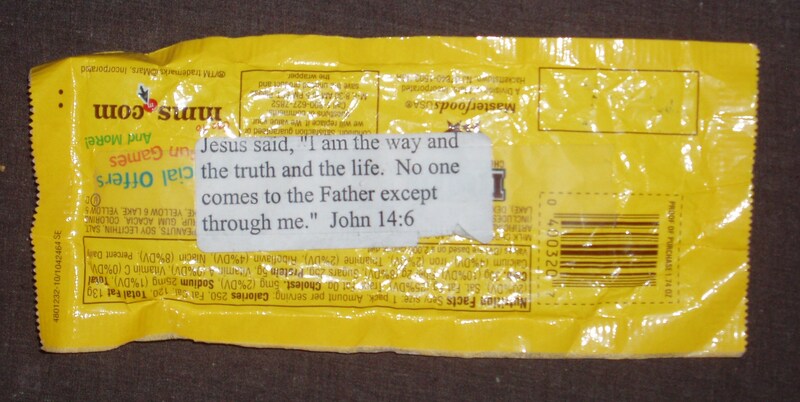 I was just savouring the first few, when I noticed a sticky note attached to the back of the wrapper. Obviously one of the households in suburban Cincinnati which I had been canvassing that Halloween night wanted kids (or their accompanying parents) to go away thinking about higher matter than ghosts and gobstoppers.